Product prices and availability are accurate as of 2019-04-26 04:06:08 UTC and are subject to change. Any price and availability information displayed on http://www.amazon.com/ at the time of purchase will apply to the purchase of this product. Designed using Moeller's time-tested components giving you the needed performance and reliability. CONTROL BOX: Includes battery burn-out and overcharge protection. The self-contained, 10 amp battery recharger system is a solid-state, automatic controller with alarms, light indicators and warning systems. LCD SCREEN: Always displays battery voltage along with other helpful information about the system. AUXILIARY ALARM CONTACT: A set of dry contacts allows system to connect to home security alarm, auto dialers, etc. SWITCH: Reliable, low voltage vertical float switch. FITTINGS: An integrated DC pump discharge check valve, additional AC pump check valve, tee and adapter are included. TECHNOLOGY: This charger uses the latest switch mode technology available. This allows for an extremely efficient charger in a compact design. It satisfies the rigid California Battery Council standards. Charger is also crus approved. BATTERY CASE: The included battery case will accommodate maximum battery dimensions of 13" L x 71/2" W x 91/2" H (33 cm L x 19 cm W x 24 cm H) and fits all group size 27, 29 and 31 batteries. Made from non-corrodible polyethylene (NOTE: 12 volt battery NOT included). NOT a Bilge pump. 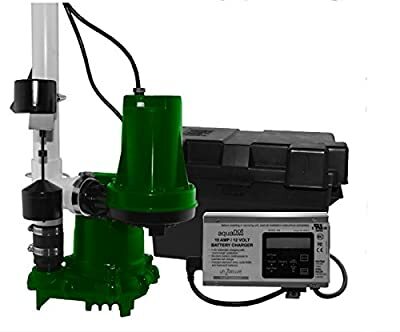 Designed, Engineered and Assembled by Moeller as a sump pump.